Guess what's inside the beguinage here - Het Anker Brewery. This is the oldest surviving brewery in Mechelen. This is located inside the Beguinage. Originally there was a hospital in this location when this was a thriving beguinage. The beguines were associated with the hospital is caretaking of the patients. At that time, the beer that was brewed here, was free of taxes. Guess what? Since beer was distilled water and alcohol, it was used for the hospital, ofcourse, also for the self-consumption of the beguines. Even today some of the buildings in this brewery date back to 15th & 16th C CE. Their inhouse beer is called Gouden Carolus, named after the golden coins of King Charles, the bold. Its logo boasts King Charles seated on a horse! Several of the original equipment are still in use. Apart from the beer brewing process, this place also serves as a storage area for the whisky. The distillery is located in Molenberg and after the process, the whisky is brought here for ageing process, till its ready for bottling. The varieties of beer here is quite interesting from blonde to dark, including flavours of caramel, plums, vanilla, chocolate, elderflower, clove, rosemary, coriander etc. The hops are exclusively sourced only within Belgium. The classic dark beer is a gorgeous ruby red. The Tripel beer is their most award winning beer. Their specialty annual limited edition beers include Christmas beer, and Indulgence series. Apart from beers, they also make konishi sake, ales and whisky. The guided tour takes you around the facility for an hour and an elaborate tasting of 2 varieties of beer happens for almost another hour. We were guided by Mr.Ward Deprins. Kids can also be a part of this tour, but ofcourse they get a fruitdrink at the end of the tour. No, I didn't get to taste any of the beer as well, my guy did! I had a coffee instead with some authentic Belgian dark chocolate.... If you're a new reader, you might ask why. I'm a new mom and I'm breastfeeding, that's why! From there, I proceeded to experience the Sense-ational Mechelen! Its a initiative by Mechelen Tourism, to experience the best of what Mechelen has to provide. I esp., followed the food trail and managed to taste some excellent stuff. 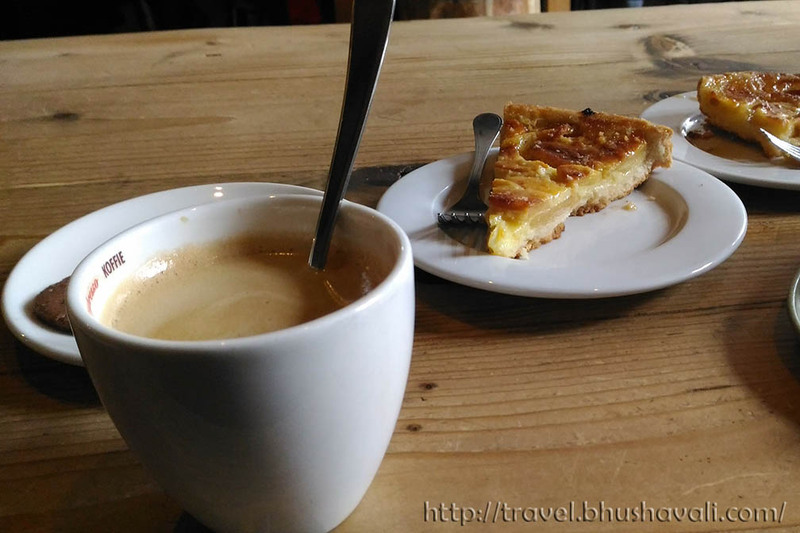 I began with coffee and a very very yummy spiked apple pie at Cafe Sava. The next stop was Bakery Vanderbeek which came with some awesome chocolates. These ones were called Moon Extinguishers, and are basically Dark Chocolate that came with assorted fillings from Peppermint to Caramel. The story of Moon Extinguishers (Maneblussers) is interesting. On Jan 27, 1687, in the foggy night, a drunken man (well, this is the beer capital of the world) saw the moon, which gave a reddish glow from behind the Rumbold's Tower. He mistook it for fire and started shouting that the tower was on fire! People attempted to extinguish the fire and some ran atop the tower only to realize that it was the moon! Yes, Mecheleners tried to extinguish the moon!!! Next stop was Schockaert’s Cheese Shop which provided 2 cheese sticks. 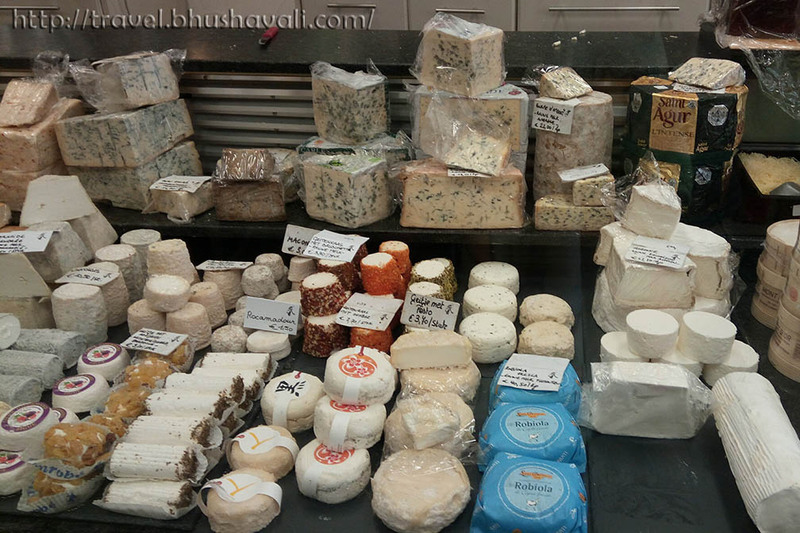 This place is a cheese lovers' heaven. Since I headed on a Sunday, the biscuit shop was closed, but the Tourism office was kind enough to keep aside a pack for me! 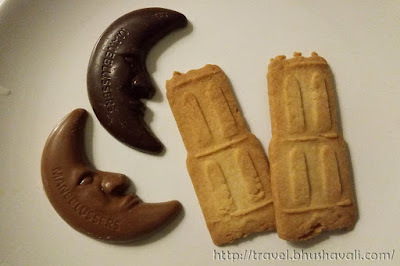 The biscuits are shaped like, take a guess.... ofcourse, Rumbold's Tower!!! I skipped the 6th one, Belgian fries at Korenmarket Chip Shop, but instead went inside Rumbold's Tower to give a snack to Atyu (well, that just means feeding her). One more in this sense-ational list was a beer at Het Anker Brewery which anyways we had with the tour. The starting point of the tour is from the reception of the hotel! Local transport within Mechelen is possible with DeLijn buses. There are no trams or metro available. P.S: I was invited by Visit Mechelen to experience the city for review purposes, however the opinions are my own and this post does not to advertise the product/service. P.S.2: Gouden Carolus beer is an alcoholic beverage. You must be of legal drinking age to consume it, as stated by your country. Excessive drinking is injurious to health. Drinking & Driving can be lethal. wow, knowing that the Het Anker Brewery is the oldest surviving brewery in Mechelen, simply means it is very interesting. Their inhouse beer seemed to be really amazing and would love to try their beer if I get the chance. You're so lucky to have strolled around in their old brewing place, which you can still see the old equipment. Thank you so much for sharing this with us. Here is a beer lover. :-) Beer with flavours of caramel, plums, vanilla, chocolate, elderflower, clove, rosemary, coriander etc. ?! Ok, I am on my way to Mechelen! And I am going to taste all the flavours !! Would love to visit also one of the oldest breweries in Mechelin. The beer is beyond its flavors - it's simply a taste of culture, history and tradition! I think I'd be more interested in the chocolates and coffee than beer! I don't know what it is but no matter how many times I try it I can't like it. Still, I love visiting breweries and think they are fascinating, especially the older ones like this. Also, funny story about the locals trying to put out the moon! I've always wanted to take a brewery tour. More than the consumption, the process of brewing and storage of beers fascinate me. This was an interesting read for me especially about the age old brewery here. Flavored Bear! that is surely some pleasure. When you have Belgian chocolate with that- thats a big WOW. I wish i could stay there forever. First of all many Congratulations for being a new mom! Your pictures speak for itself how amazing time you had here.Though I'm not a beer person but would love to take the tour if ever I'll visit Flanders, Belgium! Reading your post reminded me of a brewery visit I had to SAB Miller Brewery in Johannesburg, and the experience of the beer tour, which is still fresh in my mind. I'm a huge fan of trappist beer, and I hope since Het Anker is located inside a Beguinage, it still retains some of the characteristics of trappist beer. Given the chance, I would love to check out sense-ational Mechelen some day. Mechelen seems like it has great food! I didn't get to go there when I was in Belgium, but I love Belgian beer and chocolate, so I'm sure I'd like to try it. I'd definitely like to try the Tripel Beer at this brewery. Too bad you couldn't drink any but it was for a good cause. The brewery sounds interesting especially with so many varieties and flavours of beer. Caramel, chocolate and vanilla are the ones I would so love to try. The cheese shop, biscuits, apple pie, Belgian chocolate and coffee - wow! - what else heaven looks like? I think I just found my happy place!! I love how many varieties they serve. I am headed to Belgium this summer and I can’t wait to check this out!! Mechelen here I come!! I never would've associated a brewery with a hospital so that was interesting getting to know the history behind. And not sure why, but I kept reading "Her Anke Brewery" hahahaa. Would love to try the award-winning Tripel beer! Belgium certainly evokes images of beer and fantastic chocolate. I would love to head down to the brewery to learn more about how they make this amazing delicacy that is so tightly linked and interconnected to Belgium's image. What an interesting and fun exploration of the Het Anker Brewery - I love learning that it is the oldest brewery in Mechelen...and it also used to be a hospital. The variety of flavours made in this brewery sounds so interesting, I would love to try the clove and rosemary variety. And oooo to top it all with cheese at Schockaert’s Cheese Shop! Yummm!